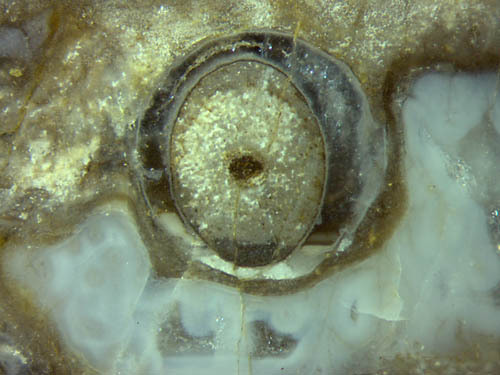 Various details seen in fossiliferous cherts and petrified wood may reveal something about the multi-stage fossilisation process. There is lots of evidence suggesting that silicification was not simultaneous everywhere: Some areas had turned into silica gel while others were still fluid, which can be deduced from the presence of wide cracks in the former gel suddenly ending at the former boundary between gel and fluid. Other evidence of the co-existence of gel and water at early stages of the silicification process is provided by sections of shrunken plants occasionally seen within the contour of the live plants (Figs.1,3,4). See also Rhynie Chert News 31. Fig.1: Circular contours of live Rhynia in chert, therein sections of Rhynia shrunk while decaying in the water-filled cylindrical cavity before becoming silicified. Width of the picture 3.5mm. The super-saturated silica-rich water flooding the stands of early land plants  may turn into silica gel soon but the cuticle on the epidermis serving as a diffusion barrier can greatly delay the silicification of the inundated plants. With most of the available silica being bound into the surrounding gel, much time can pass before the remaining dissolved silica has moved by diffusion through the pores in the cuticle of the decaying and shrinking plant in such amounts that gel is formed inside the plant, whereupon shrinkage stops. The influx of silica can be so slow that decay does not stop before the plant has vanished, leaving a cavity in the gel shaped like the live plant (Fig.2). 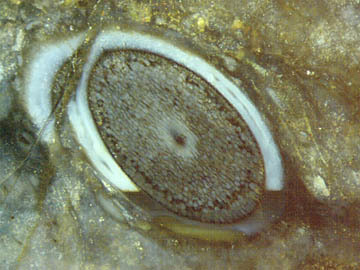 Fig.2: Cross-section of a cylindrical mould of Aglaophyton in Rhynie chert, once water-filled and occupied by aquatic fungi after complete decay of the plant and before silicification of the cavity which once had been the plant. Note the layered silica coatings deposited along the wall and around the fungus hyphae. Fig.3 (right): Inclined section of Rhynia (?) 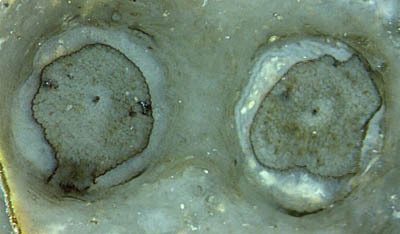 flattened by flooding, well preserved with ring of dark cells with symbiotic fungus but shrunk away from its cylindrical enclosure of 2mm width. Note the deposit with two level interfaces at the bottom of the cylindrical gap, which had been silica emulsion at some stage of silicification, stained dark possibly by organic admixture. Fig.4 (below): Cross-section of Horneophyton (?) flattened by flooding with silica-rich water turning into silica gel, thus forming a cylindrical enclosure of 2.5mm width, from which the plant shrunk away owing to rot. Note the whitish deposit at the bottom with levels of unequal height. What is now seen as bluish chalcedony had been a swamp gas bubble pushing on the inundated live plant. Obviously it did push no more while the meanwhile dead and decaying plant shrunk away from its enclosure, otherwise it would have followed the contour of the shrinking plant. Hence, some time must have elapsed between flooding and shrinking. The bubble must have become filled with silica-rich water by diffusional outflow of gas and inflow of water. Apparently the water had been teeming with microbial life. A thick layer of microbial slime had grown in the water along the boundary of the water-filled cavity. Subsequently, silica gel must have been deposited in the former bubble, which had not been a one-step process, as can be concluded from the two small cavities below, which persisted for a while between the gel until silica clusters settled into an emulsion separated from the water above by a level boundary. (Much later, crystalline quartz grew in the remaining water.) In a first step the microbial layer seems to have turned into gel, now seen as a brown-stained chalcedony layer. Similar as with Fig.3, of particular interest is here what happened in the water-filled gap between the silica gel mould of the live plant, circular in Fig.4, and the not yet silicified shrinking plant. As explained above, silica clusters accumulate at the bottom of the gap. The resulting emulsion with two level interfaces, left and right, eventually solidifies. Hence, newly formed emulsion finds itself in separate compartments and makes levels whose heights are not correlated. While the latter emulsion, too, solidifies, the plant shrinks further and separates from the layer, leaving two tiny gaps hardly visible in Fig.4. Shrinkage stops as soon as the decaying plant is stablized by silica gel. 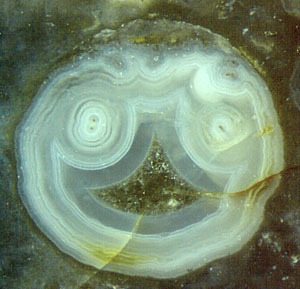 The silica solution in the cavity or gap surrounding the shrunken plant may still be fluid by that time but the continuing slow diffusional inflow of dissolved silica and outflow of water turns the shrunken plant and the deposit into chalcedony and give rise to the growth of coarse-crystalline quartz until the gap is filled. The clear quartz crystals let the incident light pass into depth and therefore look dark. As usual with the chert fossils, some questions are left unanswered. The different aspects, with whitish chalcedony at the top in Fig.3 but at the bottom in Fig.4, may be confusing. Also one may wonder why quartz forms in some cases (Figs.2,4) but not in some others (Figs.1,3). Coarse quartz is usually said to be the last formation in the silicification series, as it doubtless is in Figs.2,4, but there is contrary evidence from petrified wood: Occasionally, mm-size crystals may come first, chalcedony later. See Fossil Wood News 1.